The building boom for St. Luke’s Health System continues with the announcement of a new Mountain States Tumor Institute cancer care center in Nampa. 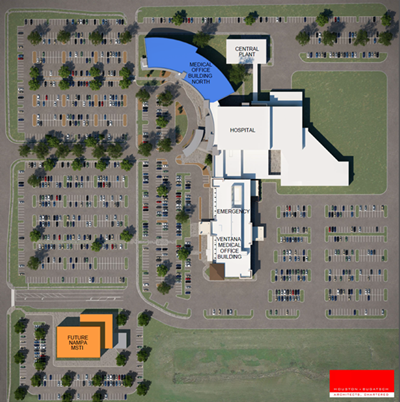 Crews will build a new 42,000 square foot building for MSTI on the St. Luke’s Nampa Medical Center off Midland Blvd. The new facility will replace an aging building near the NNU campus and will be more than twice the size. More than 16,500 patients a year seek treatment at Nampa MSTI, with volumes expected to increase by another 3,000 by next year. The new facility will increase exam rooms from nine to 24, and will add space for psychiatric care, survivorship services, spiritual care and more. The health system hopes to start construction in August and be open within two years. It’s one of a number of projects St. Luke’s is building or planning. A new Children’s Pavilion will open this fall on the Boise campus. A new 230,000 square foot medical facility is underway at 27th & Fairview in Boise. Plus, a large expansion to the core Bosie regional medical center is also in the works.